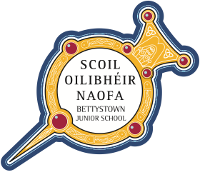 Welcome to Scoil Oilibhéir Naofa’s school website. We are a co-education, Catholic, Junior school, catering for children ages 4-9 years. Currently we have 428 children on roll, 24 teaching staff and 6 Special Needs Assistants. Our A.S.D. unit ‘Loughcrew’ caters for children who have been diagnosed as being on the autistic spectrum and they are integrated with mainstream classes as much as possible. Scoil Oilibéir Naofa is an inclusive school, which aspires to celebrate and respect diversity, while promoting the formation of our pupils in the Roman Catholic faith. Our school strives at all times to provide a happy, caring, learning environment. We aspire to enable all our pupils to reach their potential, through a rich variety of educational experiences and activities. We seek at all times the support and assistance of our parents so that home and school can work together for the benefit of all our students. We promote the full and harmonious development of all aspects of the pupil- intellectual, physical, cultural, spiritual, emotional, and moral. We encourage our children at all times to treat one another and staff with respect, courtesy, kindness and friendship –this is promoted in classrooms, in the playground and at our weekly assemblies. We aim to create a positive atmosphere throughout the school, where we work together as a team.